Quinteiro da Cruz is an owned property of the Piñeiro Lago family, with an area of 70,000 m2, of which 30,000 m2 are dedicated to the plantation of the albariño grape. The house is from the end of 18th century, and is an example of Galician neoclassical noble architecture. The garden is made up of two well-defined areas; an older one created at the end of the 19th century, and another from the end of the 20th century. The garden is surrounded by vineyards and native woodland with mature trees (oak, chestnut, pine, box and laurel, among others). The vineyard covers almost three hectares and grows Albariño grapes, used to make the wine that bears the name of the estate: Albariño Quinteiro da Cruz. Quinteiro da Cruz has the soul of a museum, providing a home for over 250 genus of plants from the 5 continents, where you can see, among other trees of interest, such specimens as: Aesculus hippocastanum, Araucaria brasiliensis, Banksia, Buxus sp., Callistemon, Cedrus atlantica, Chamaecyperis pisifera, Chorisia, Cordyline australis, Cupressus sempervirens, Erythrina crista-galli, Lagerstroemia indica, Magnolia grandiflora, Phoenix dactilifera, Phytolaca dioica, Protea, Robinia pseudoacacia, etc. 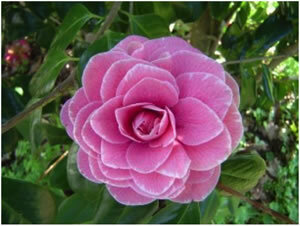 Camellias are true protagonists of the garden, for which it is known as the paradise of the camellia. Year after year there bloom roughly 2,000 exemplars of about 600 varieties from almost 70 different species, including: Camellia assimilis, C. caudata, C. cuspidata, C. fluviatilis, C. nitidissima, C. granthamiana, C. sasanqua, C. sinensis, with highlights being exemplars of C. japonica and C. reticulata, thanks to which the “Camellia Gold award” at the International Camellia Show was obtained on several occasions (1988, 1990 and 1998). Among the camellia cultivars, it is possible to enjoy ‘Angelina Vieira’, ‘Augusto Leal de Gouveia Pinto’, ‘Grace Albritton’, ‘Happy Higo’, ‘Mathotiana Alba’, ‘Nuccio’s Gem’, ‘Tama-no-ura’, ‘IncarnataCamurça’, ‘Covina’ by C. japonica; ‘Captain Rawes’, ‘Miss Tulare’, ‘Interval’ and ‘Dr. Clifford Parks’ by C. reticulata; ‘Rendezvous’ by C.x williamsii. Also noteworthy is a small plantation of Camellia sinensis for tea making. The Quinteiro da Cruz collection of camellias has a few specimens dating from the end of the 19th century, distributed around the house. These specimens are trees that have reached significant size with sturdy trunks, but there is one that stands out among them, a specimen of Camellia japonica 'Covina'. In the garden you can enjoy the camellia flower all year round, thanks to the great variety of camellia species, which is also the first collection of camellias to feature augmented reality (AR), a project that generates experiences and provides knowledge about the world of the camellia, of botany and nature with evocative language, magic and mystery: an interactive classroom where nature itself teaches you. 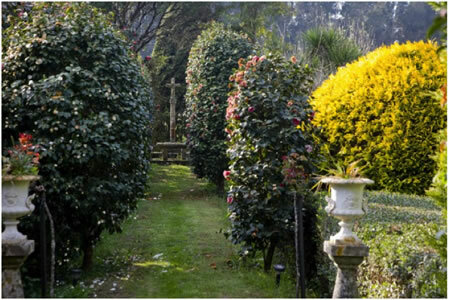 The garden has been included in the Camellia Route of Galicia since 2009. This route was created by the Xunta de Galicia through a joint effort with the Spanish Camellia Society and the Areeiro Phytopathological Station (Pontevedra Provincial Council), under the supervision of the Turismo de Galicia (Galician Tourist Board). The aim of this tourist trail is to promote the camellia as a distinctive tourism product for the northwest region of Spain. The trail initially included eight gardens (2006), but was expanded in 2009 and it is currently made up of twelve gardens. A Cruz, 12 - Lois. 36635 Ribadumia. Pontevedra. SPAIN. The garden is open to the public all year round, but always by appointment as it is a private property and a family home.